Original SWAT 1312 Chase 9" Tactical Side Zip Boots FREE SHIPPING! 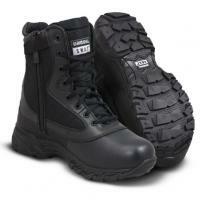 Travel longer, harder and further wearing the 1312 Chase 9" Tactical Side-Zip Boots from Original S.W.A.T. Engineered to offer safe and reliable footing, the boots employ a slip and oil-resistant outsole that exceeds test standards for both slip-resistance and electrical hazard protection. An aggressive tread pattern provides additional traction over rough terrain, while arch grooves deliver increased stability on ladders and ropes. A thermoplastic heel counter cradles the heel to offer maximum arch support and prevents over pronation that causes foot, shin and knee pain. A molded phylon midsole delivers additional support and impact absorption to prevent foot fatigue. Leaving no detail overlooked, the model 1312 employs a gusseted tongue to keep out irritating dirt and debris for all day comfort through any environment. ©2002-2019 CopsPlus.com: Original SWAT 1312 Chase 9" Tactical Side Zip Boots FREE SHIPPING!